Below is the video from the first part of last week’s event at Columbia University that featured key leadership figures from the official Greek opposition party (SYRIZA). (3:29) Alexis Tsipras, Leader of the Opposition in Greek Parliament, Leader of SYRIZA, and President of Synaspismós. (46:40) Panel discussion, featuring Rena Dourou, Member of Greek Parliament (SYRIZA); Critic of the Opposition for the Foreign Relations and European Issues, Yiannis Milios, Economic Advisor, SYRIZA, Member of the Political Secretariat of Synaspismos and Professor of Political Economy, National Technical University of Athens, Mathew Forstater, Professor of Economics and Director, Center for Full Employment and Price Security, University of Missouri – Kansas City, and Research Associate, Levy Economics Institute, Katharina Pistor, Professor of Law and Director, Center for Global Legal Transformation, Columbia Law School, and Thomas Ferguson Director of Research Programs, the Institute for New Economic Thinking (INET). To recap very quickly, we agreed that sovereign government cannot become “insolvent” and forced to involuntarily default on commitments in its own currency. We moved on to “math sustainability” and agreed that so long as the interest rate paid on sovereign debt is below the GDP growth rate, then government does not necessarily face explosive growth of deficits and debts. And we agreed that the overnight interest rate is a policy variable, so that the central bank could keep it below the growth rate if desired. And we agreed that Treasury could use a “debt management” strategy to ensure that its average rate paid would be “low”—near to the Fed’s target rate, and if the Fed was pursuing a low rate strategy then on likely growth rates usually used in these types of models then the Treasury’s rate paid could be kept below the growth rate. 1. Even if it is possible always to keep g>r (both nominal) as inflation accelerates, would we really want to do so? Is there always some steady rate of inflation that guarantees g>r, or does it take continuously accelerating inflation? Are there any conditions under which accelerating inflation itself can undermine real output growth? Are Currency Warriors’ Gloves Coming Off? There is much hype about “currency wars” in the international media this week, reaching the heights of the Davos gathering. The excitement seems to have been started by Bundesbank president Jens Weidmann, who earlier this week aired his concerns about an apparent politicization of exchange rates owing to an erosion of central bank independence and rising political pressures for more aggressive monetary policies. Japan is the current focus of attention, as the deflation-worn nation is said to have kicked off a new round in the covert global battle for competitive advantage through currency manipulation by announcing a somewhat higher inflation target as well as new quantitative easing measures. In fact, the yen has depreciated markedly since last Fall against the U.S. dollar and even more so against the euro in anticipation of fresh policy moves by the Japanese authorities. There is of course nothing new about sharp movements in the yen’s exchange rate. With zero interest rate policies in place for more than a decade, the yen for long won the popularity contest as carry-trade funding currency; with corresponding gyrations seen in winding versus unwinding phases in the global carry trade game. So the yen has appreciated strongly since the global crisis as the spectrum of funding currencies increased. Nor would it be the first time that the Japanese authorities have sought out deliberate measures designed to weaken the currency despite officially hosting a “floating” exchange rate determined “by market forces.” Long before the global crisis hit, Japan championed a version of quantitative easing that focused on FX reserve accumulation. The key difference is that other nations used to view such moves more benignly when times were still better at home. Today, with all key advanced economies still struggling to recover, and each of them hoping for relief through exports, zero tolerance and envy meet the nation that is seen as getting ahead in the common campaign for a competitive currency. The euro appears to be the “victim” in all this. Paradoxically, as it may seem at first, while other currencies tend to weaken as their monetary authorities take on a more aggressive easing stance the euro has actually appreciated since Mario Draghi’s famous pledge to do “whatever it takes” to preserve the euro, promising—conditional—support for public debt of euro crisis countries. The ECB’s peculiar ways, its reluctance to be more forthcoming with monetary support, except when the euro seems to be on the verge of breakup, is being identified as the factor that might explain why the euro is the odd man out at the current juncture. Update: the transcripts were released this morning (Jan. 18) and are available here. Any day now, the transcripts from the 2007 Federal Reserve Open Market Committee meetings will be released to the public (FOMC transcripts are withheld for five years). These transcripts should give us some additional insight into the discussions that were occurring around the outbreak of the global financial crisis and help fill in our understanding of the reasoning behind the Fed’s initial response. See here for the detailed breakdown of what we already know about the Fed’s “unconventional” lender-of-last-resort responses, including tallies of all the loans and asset purchases made under various special programs and facilities, and breakdowns of the support provided to major recipients. The Federal Reserve operated with a large degree of discretion during the course of the crisis (under the auspices of Section 13(3) of the Federal Reserve Act) and Dodd-Frank allegedly places some new limits on those powers—while also enshrining new regulatory responsibilities for the Fed. On net, what does this all mean for the Federal Reserve’s power and discretion in a post-Dodd-Frank era? In a new one-pager, Bernard Shull assesses the question and expresses some skepticism about the idea that the Fed will be meaningfully constrained by the new rules. … it does not permit the Fed to target specific companies, as it did with AIG in the recent crisis. It does permit the extension of credit within a “broad-based” program, albeit with Treasury approval. However, this is a weak constraint. The Fed could circumvent this limitation by organizing private consortiums, as it did for Long-Term Capital Management in 1998. “Circumvention” may be the wrong word, as the executive branch has been at least as determined as the Fed to extend credit to nonbanks in the face of a systemic threat. Read the one-pager here. For a longer treatment, see Shull’s working paper. Germany’s Federal Statistical Office released its first estimate of German GDP in 2012 at a press conference held in Wiesbaden yesterday: “German economy withstands the European economic crisis in 2012.” Reporting that growth slowed markedly in Germany last year, down to only 0.7 percent from 3 percent in 2011 and 4.2 percent in 2010, the international media seemed to pin the slump (the Office’s estimate assumes a contraction in GDP of 0.5 percent in the final quarter) on the euro crisis (FT.com: “Germany hit by debt crisis turbulence”; WSJ.com: “Euro crisis damps German growth”). It is rather unsurprising that German exports have not been doing so well in the crisis-stricken countries of the euro area of late. Germany’s trade and current account surpluses with its euro partners have declined significantly. But so far the crisis has actually been a mixed blessing overall. For one thing, benefiting from its haven status, Germany’s interest rates and financing costs are extremely favorable. While lending support to property markets, finance minister Wolfgang Schäuble enjoyed a nice windfall too, as Germany’s general government budget ended the year with a small surplus, in part owing to savings on debt interest payments (much in contrast to his partners elsewhere in the area). Next week, January 24th, the Modern Money and Public Purpose seminar at Columbia University will feature a special session with top leadership from the Greek opposition party, SYRIZA, including leader of the opposition Alexis Tsipras and economy critic George Stathakis (who gave an entertaining talk at the November Minsky conference in Berlin—see Session 3 for audio). This special event will also feature the Levy Institute’s Mathew Forstater and our director of the Gender Equality and the Economy program, Rania Antonopoulos. See here for a full schedule and list of participants. Below is the video from the latest session of the Modern Money and Public Purpose seminar at Columbia University, featuring Jan Kregel and Forbes‘ John Harvey. The session touched on the sustainability of fiscal and trade deficits, why economists need to study accounting, the risks of paying down the government debt, the real meaning of “fiscal responsibility,” and the assumptions about the appropriate size of government that are sowing confusion in the budget debate. One suspects that some objections to the large-denomination platinum coin on the grounds of “silliness” are motivated by simple incredulity about the nature of money. Behind a lot of the Dr. Evil-themed snickering there lurks a very common “metallist” conception: an insistence that money must always be backed by something like gold, or in the case of the trillion-dollar coin, that its value is given by the value of the platinum in the coin; something other than the mere fiat of government. To those who are moved by the argument that the US government has “run out of money,” the reality of money, as laid bare by the platinum coin discussion, must appear deeply unserious and fantastical (we might as well just grab a bunch of sticks and call those money!). For many people, these themes take us beyond the realm of reasoned argument and well into what Krugman called “a collision of worldviews.” Or as Stephanie Kelton put it: “Money scares the bejesus out of people.” To Randall Wray, a deeply entrenched misunderstanding of money underlies a host of views about debt and the role of government; successfully confronting this constellation of beliefs and assumptions, he argues, requires an exercise in meme-building. In the latest phase of our endless budget brinksmanship, congressional Republicans will attempt to extract policy concessions in return for raising the debt limit (Republicans are not only demanding cuts to Social Security and Medicare—they are brazenly demanding that Democrats propose, and therefore own, these unpopular cuts). The administration and key allies are claiming they will not negotiate over the debt limit. At stake in this standoff is not just whether the federal government will default on its financial commitments (which is to say, whether Congress will absurdly prevent the government from paying the bills that Congress has legally obligated it to rack up) but also whether we will move one step further toward making these standoffs a customary part of the (mal)functioning of government. In the context of some key changes made by the Dodd-Frank Act, this new normal on the debt ceiling has disquieting implications for how the federal government will respond when the next financial crisis hits. Dodd-Frank doesn’t do much to prevent the next crisis from emerging, but it does change the way the government can respond. At last year’s Minsky conference in New York (see Session 6), Morgan Ricks noted that a number of organizations that played a large role in the response to the financial meltdown (Fed, Treasury, FDIC) have seen their discretionary authority limited by Dodd-Frank. Most notably, the Federal Reserve’s leeway under section 13(3) of the Federal Reserve Act has been curbed (13 allowed the Fed to lend, “under unusual and exigent circumstances,” to individuals, partnerships, and corporations at its own discretion; it was under this authority that most of the unconventional lending and asset purchases were carried out). After Dodd-Frank, Ricks observed, we are now supposed to rely on the FDIC’s newly-created “Orderly Liquidation Authority” (OLA) to handle the collapse of a large multifunction financial institution. The use of the OLA requires the approval of the Treasury Secretary and two-thirds of the both the Federal Reserve board and the FDIC board, but most importantly, funding for the OLA will come from the Treasury rather than the Federal Reserve. Ricks pointed out that since the Treasury would have to issue debt to provide such funding (assuming platinum coins are off the table), this means that a future government rescue through the OLA may require that Congress lift the debt ceiling in the midst of a financial emergency. You might say this adds a laudable element of accountability and transparency to any future crisis response. But after watching Congress perform these past two years, how confident are you that this will end well? That’s from a new policy note by Giorgos Argitis. Argitis focuses on the “Greek deal” reached this past November and concludes that it, along with the troika’s entire strategy to date, cannot succeed—even by its own cramped set of objectives. “[T]he debt structure of the Greek public sector was not sustainable before, did not become sustainable after the ‘haircut’ in March 2012, and will not become sustainable as a result of the Eurogroup’s decision in November,” he writes. 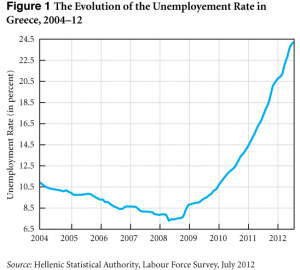 The problem is not just that austerity is creating devastating levels of unemployment (which, if you’ve been following the debate, is all-too-easily dismissed as a necessary cost—a sign of virtuous suffering), but that the economic damage is so severe that the austerity strategy is likely to be self-defeating on its own terms, which is to say, with regard to the objective of significantly reducing debt-to-GDP ratios. The enforcement of austerity keeps Greece locked in what Argitis calls a “default trap.” Fiddling with the pace of fiscal consolidation is not going to fix this strategy. We need to move in a new direction, according to Argitis, involving a more fundamental restructuring of Greek public debt and policies to generate growth in the short and long term. 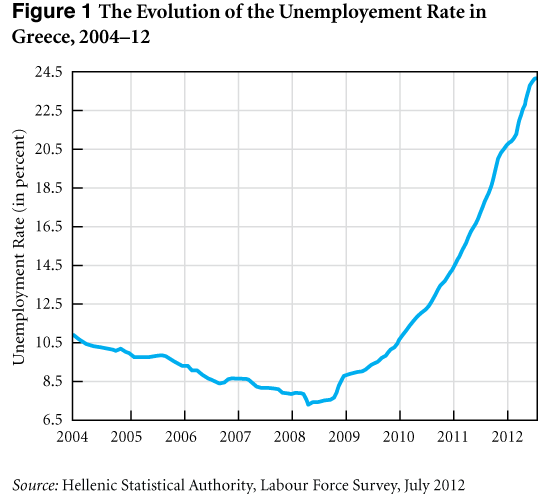 Argitis borrows from Minsky’s idea of an employer of last resort and calls for the creation of employment guarantee programs (like this ones described here) that can create immediate economic expansion and ultimately generate the primary surpluses Greece needs to meet its debt obligations.